was a United States Military airfield in West Berlin, Germany between 1945 and 1994. During its operational life, it was garrisoned by the United States Air Force, with units of the United States Army Berlin Brigade located within the facility. TCA was located in the southern suburbs of greater Berlin, about 2 miles from the center of the city. It was bounded on the north by Columbiadamm, on the west by Mehringdamm, and on the south by the Templehof Freight Terminal; about 1/2 mile north of the Teltow Canal in the "American Sector" of West Berlin. A German commercial airport was erected on the site in 1922 and a modern European international airport was established in 1934. Ernst Sagebiel designed Tempelhof's futuristic airfield facilities and terminal 1934-1936, and converted it into a major European and international airport. 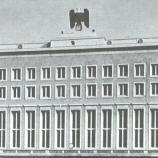 Templehof Airport officially opened in 1936, with peak passenger traffic attained in 1938-1939. Germany did not use Tempelhof as a military airfield during World War II, except for occasional emergency landings by fighter aircraft. The airfield was seized by the Soviet Union Red Army in April, 1945 and turned over to the United States in July 1945 with the division of Berlin into occupation zones. TCA was established as an aerial port on 2 July 1945. Reconstruction of the facility began on 3 July 1945, with its first operational use in August. 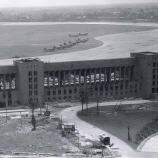 Tempelhof hosted passengers arriving and departing the Potsdam Conference, and served as Berlin center for the European Air Transport Service (EATS) from September 1945 to March 1948. TCA also supported the mission of the Office of the High Commissioner of Germany (HICOG), and air-sea rescue operations center when USAFE assumed the direct responsibilities of EATS on 20 December 1947. With the formation of the United States Air Force in 1947, Tempelhof became a USAF base. The United States Air Forces in Europe (USAFE) renamed the facility "Tempelhof Air Base". Soviet troops closed off all surface routes into West Berlin on 20 June 1948, compelling the Western Allies to establish the greatest military airlift in history, the "Berlin Airlift", flying millions of tons of fuel, clothing, and food into Tempelhof for the beleaguered West Berliners. Engineers constructed a new 6,000-ft runway between July and September 1948 and another between September and October 1948 to accommodate the expanding requirements of the airlift. 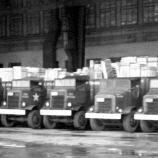 The last airlift transport touched down at Tempelhof on 30 September 1949. In 1971 one of the pilots during the Berlin Airlift, and the original Candy Bomber, Gail Halvorsen, returned to Berlin as the commander of Tempelhof Central Airport. 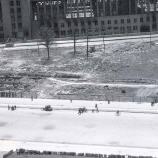 A civil aviation agreement allowed the major airlines to use the airport beginning on 22 May 1950, and U.S. authorities turned over the northeast corner of the airport to the City of Berlin for recreational purposes in 1950. 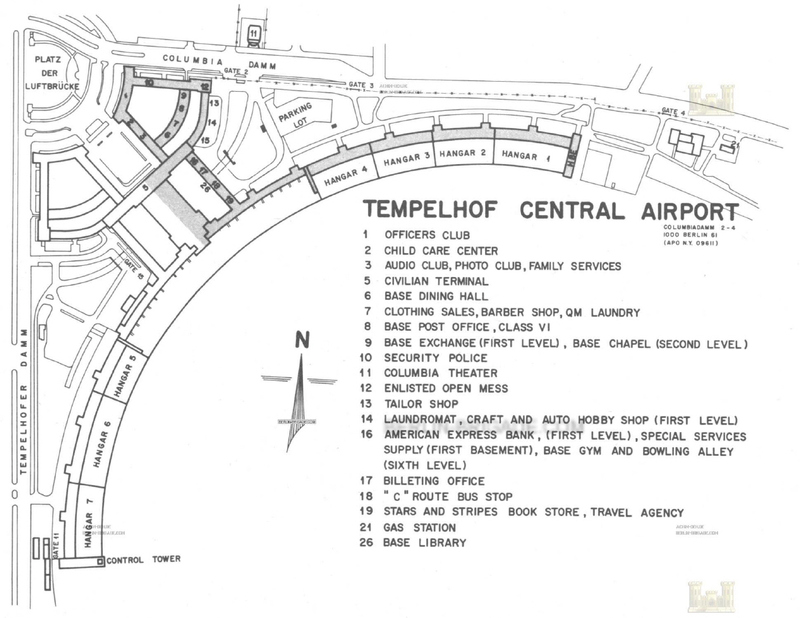 USAFE renamed the facility "Tempelhof Central Airport" on 28 February 1958, and on 15 November 1959 administration of Tempelhof was transferred to Ramstein AB. On 1 September 1975, when all civil air traffic was transferred to Berlin Tegel Airport. With civil traffic routed to Tegel, TCA was used soley by U.S. military airlift traffic until the end of the Cold War. With the fall of the Berlin Wall and the reunification of Germany, the presence of American forces in Berlin ended. The USAF 7350th Air Base Group at Tempelhof was deactivated on 29 January 1993. In July 1994, with President Clinton in attendance, the British, French, and American air and land forces in Berlin were deactivated in a ceremony on the Four Ring Parade field at Tempelhof in accordance with the Treaty on the Final Settlement with Respect to Germany. 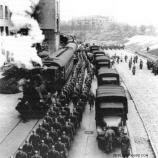 The Western Allies returned a united city of Berlin to the unified German government. The U.S. Army closed its Berlin Army Aviation Detachment at TCA in August 1994, ending a 49-year American military presence in Berlin. TODAY: 4 - TOTAL: 11196.